What’s needed to plant a church isn’t the wisdom of Jim Collins, but the gospel of Jesus Christ. Listen to “Session 1 – Do you start with Preaching or Flyers? – Nathan Knight” on Spreaker. 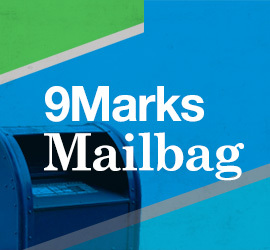 9Marks, the North American Mission Board, and Send partnered together for a one-day conference on church revitalization in Washington, DC. Five years of service in your local church will yield much better dividends than five hours of being evaluated by the greatest church planting minds in the country. I think we should stop talking about “launching” new church plants and instead refer to them “covenanting” for the first time. This book will provide a laser-sharp vision for a young pastor just getting his feet wet in the ministry.